It has been a long time since I last drove a Mazda. Two years in fact, when my ‘better half’ owned a previous generation Mazda 3. It wasn’t great… it was a little sluggish, didn’t handle all that well and was hard on fuel, which was disappointing given the lack of performance. I used to own a Mazda as well; an imported Japanese Domestic Model Mk1 MX-5 that was fully motorsport prepared. After some major upgrades it sounded fabulous, handled great and went reasonably well, but most of all stood the test of a year’s constant abuse taking part in motorsport events. It even helped me to second overall in the TSCC championship and the accolade of “driver of the year” too! 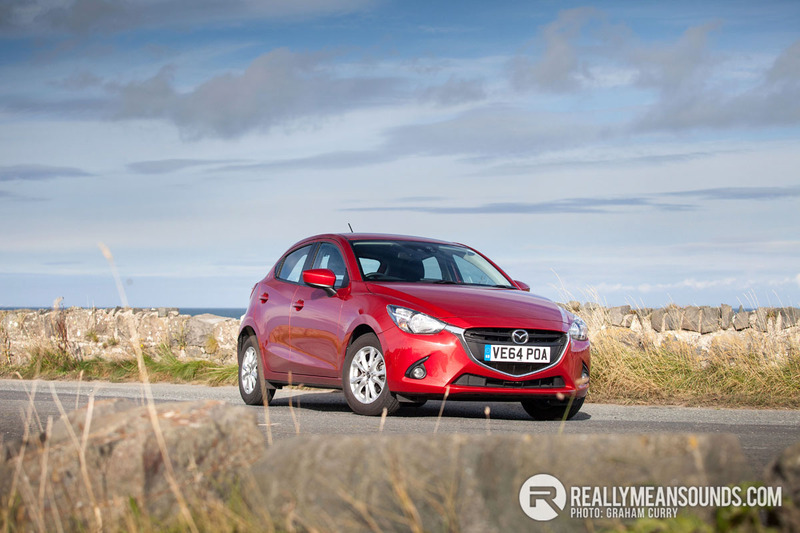 On the back of that mixed experience with the brand, I genuinely wasn’t sure what to expect when I heard I was going to test-drive the all new Mazda 2. So when I arrived home to see the stunning Soul Red metallic paint (£650 option) sparkling in the sunlight, I was immediately impressed. I couldn’t help but notice that the Mazda 2 has become quite a large car, far removed from the previous model. It’s incredibly grown-up looking, with the signature open mouth and pointed bonnet/upper bumper that the Mazda design team have implemented across the ranges. I think it really is a stunning front end. With five doors, the Mazda 2 is a practical car, suitable for a young family, a young person with lots of friends or a couple of canine family members. The ease of access was good and the amount of room in the rear was surprisingly plentiful for a car of this size, even for two adults. The front seats were comfortable, with ample room, but perhaps a little more bolster support would be an improvement. That said, this is a personal gripe, as I am used to driving cars with sports interiors that offer a little more support, especially for the ever expanding waistline! The dash was well laid out, with a screen in the centre that is angled slightly towards the passenger rather than the driver. This screen is the hub of the infotainment system which offered sat nav, BlueTooth, USB media input, SD Card input, DAB radio. The controls for the unit were situated down by the handbrake and I found the various knobs and buttons easy to use. For a car of this size and given the affordable price (OTR starting at just over £14k), I was impressed with the sheer amount of technology. The car even has the ability to show pop up notifications for SMS and e-mail on the screen, with the option to read and reply (not advisable whilst driving though). Electric windows and mirrors come as standard and this test car from Mazda UK was also equipped with cruise control, which was simple to understand and use. In fact, all but the very base model come with cruise control as standard. The materials used within the cabin have come a long way from previous generations. The Mazda 2 feels well put together and solid throughout, without succumbing to that old ‘plastic’ feel inside. Boot space was adequate and the boot floor was sunken, so I reckon a small buggy with some shopping would fit with ease. After taking the car for a spin, I must take my hat off to Mazda’s chassis development engineers. They have really worked magic with the new generation of models – the ride was firm but very comfortable and cornering was smooth and precise, with minimal effort and body roll. I felt confident driving the car and trusted its predictable mannerisms. The Mazada felt like it was a much bigger, grounded car. For this alone, well done Mazda! Around town the 2 was very light and nimble, but I did find visibility very restrictive out of the back due to the large C pillar and a little restrictive from the side because of the B pillar. Engine wise there is only one capacity available – a 1500cc – but there are two fuel types and four outputs to choose from. The single diesel on offer is a turbocharged unit producing 104bhp with a five speed manual gearbox. The petrol engines comes with either 74bhp, 89bhp or 113bhp. All have a five speed manual gearbox, though the 89bhp model can be ordered with a six speed automatic. The car I drove had the 89bhp engine with five speed manual gearbox. For a car that will rarely be out of the city and rarely attempting to break the speed limits, the engine was reasonably lively. On mixed driving over the period of a week, it didn’t struggle at all and it didn’t need to be revved hard, as there was plenty of usable torque. However, the biggest surprise of all was the real world combined MPG of 51, which is on par with many large capacity modern diesels. This economy is thanks to Mazda’s ‘SKYACTIV’ technology. In Mazda’s words, ‘SKYACTIV engines can compress the air-fuel mixture in the cylinders to an extraordinary degree, squeezing far more energy from every drop of fuel’. Sounds like snazzy marketing speak but it works! I reckon the Mazda 2 is going to be a popular little car and for good reason too. It’s well built, handles well, has decent performance, great economy and is spacious inside with annual road tax of just £20. Good write up but imo that is a very boring looking car. Decent read, that. Not that convinced by the styling myself, either. cheers for the feedback chaps, we do like plenty of opinions on these reviews :) Have the new Mazda CX-3 coming so i am looking forward to seeing what their crossover has to offer !